Glennon are delighted to be the new affiliate partner for Unite members & their spouses or partners in the Republic of Ireland. TO OBTAIN A QUOTATION OR TO FIND OUT MORE CALL US TODAY 1890 989 345 OR VISIT US ONLINE unite.glennons.ie Frank Glennon Limited, trading as “Glennon” and “Glennon Insurances”, is regulated by the Central Bank of Ireland. Living Wage The concept of a Living Wage – a wage that would afford every worker a decent standard of living – goes back to the nineteenth century, and was first politically championed by Fabians Sidney and Beatrice Webb in 1898. 120 years later, the independently-calculated Living Wage has developed into a powerful tool for working people and the trade union movement. Fascism is a chameleon. It changes form, shapeshifting to suit different eras and places. But one thing is a constant: fascism – and its close relatives, ultranationalism and authoritarianism – is the enemy of working people. And it is only by working people organising in communities that it can be defeated. It was formalised in the UK in 2011, when the ‘Minimum Income Standard’ was first calculated by researchers at Loughborough University, and in the Republic of Ireland in 2014, when the ‘Living Wage Technical Group’ was formed to calculate a Living Wage based on ‘Minimum Essential Budget’ research carried out by the Vincentians. In 1936, Dublin-born trade unionist, communist and lifelong anti-Fascist Max Levitas helped face down Fascism in the ‘Battle of Cable Street’. Socialists, Communists, anarchists, trade unionists and others filled the streets in solidarity with their Jewish neighbours under attack by Oswald Mosley’s Blackshirts. 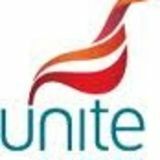 The Living Wage provides a benchmark of decency, and has been the focus of successful Unite campaigns in sectors as diverse as local authority workers in Northern Ireland and archaeologists in the Republic. Max Levitas died in early November, having spent a lifetime fighting Fascism, racism and social exclusion – whether as a councillor in Tower Hamlets or as a tenants’ rights activist well into his 90s. Poverty pay is endemic North and South. In Northern Ireland, 13 per cent of households with at least one adult in paid employment are in poverty, while approximately the same percentage of people in work are at risk of poverty in the Republic. Eighty-two years after Dubliner Max Levitas helped face down Mosley’s thugs in London’s East End, the far right is again on the rise – and trade unionists are again on the front line of the fight for our democratic values – whether in Ireland or Britain, continental Europe or the United States. The Living Wage can help lift workers out of poverty – but unions know that the most reliable route to decent jobs paying decent wages remains organising and collective bargaining. And the Living Wage is a substitute for neither: it is simply one of the many tools we can use to defend and advance workers’ rights. In particular, the Living Wage has proven to be an invaluable communications tool, understood both by the media and the general public as the threshold of decency below which no workers should be allowed to fall. Given that it is independently calculated as the minimum needed for a decent standard of living, the Living Wage also highlights the inadequacy of the statutory minimum wage in both the UK and Ireland: in both jurisdictions, the minimum wage falls significantly short of a Living Wage. The politics of exclusion – of othering – needs easily identifiable enemies. In 1930s Germany it was Jews; in today’s Germany it is Muslims. In the Republic, as demonstrated by Peter Casey’s performance in last year’s Presidential election, it is Travellers. In Northern Ireland, Britain First has been trying to drum up anti-Roma sentiment. The list goes on – and wherever racists and fascists organise, the trade union movement must be there, working with communities to push them back. Unite will continue working with other unions and civil society groups, including Living Wage groups and campaigns, to tackle the scourge of low pay through the island of Ireland. Internally, we must continue educating members about racism, Islamophobia and anti-Semitism. But we also need to stand side-by-side with communities on the streets, as the trade union movement did in 1936. Our movement has a unique ability to bring working people together – not just in the workplace, but in the community. Announcing Max Levitas’ death, his family said “No Pasaran!” - and with Max they never did. In solidarity Jackie Pollock, regional secretary uniteWORKS Ireland No:4 26-34 Antrim Road, Belfast BT15 2AA uniteWORKS Ireland No:4 26-34 Antrim Road, Belfast BT15 2AA Tel: 028 90 232381 Fax: 028 90 329904 Tel: 028 90 232381 Fax: 028 90 329904 Magazine enquiries and letters to the editor, by post, phone, Magazine enquiries and letters to the editor, by post, phone, or email uniteworksireland@unitetheunion.org or email uniteworksireland@unitetheunion.org Distribution enquiries contact your regional office. Distribution enquiries contact your regional office Available digitally. As trade unionists, we need to continue saying ‘No Pasaran!’ in Belfast, Dublin and London. Health, safety and a dose of solidarity According to the Health and Safety Authority, 8,709 non-fatal workplace injuries were reported in 2017, with manual handling accounting for approximately a third of reported injuries. And those figures just relate to reported injuries. When it comes to work-related deaths, farming continues to be the most dangerous sector in which to work, followed by the construction and transportation/storage sectors. Thanks to improved health and safety awareness, numbers of work-related injuries and deaths have been falling in recent years, but there’s still clearly work to be done. Ken Smith is a Unite member, crane operator and grandfather who has worked in the construction sector for over 25 years. As a long-standing union activist, Ken is a shop steward and a member of the Construction Branch Committee. “In 2016, following intensive engagement at the WRC and Labour Court, a comprehensive cost-cutting agreement was reached which is due for renewal next year. This agreement was predicated on a phased reduction of peat production up until 2030, which would have required minimum redundancies with job reductions largely achieved as a result of natural attrition, and provided for some new jobs to be created during that period. “Now, the reduction in peat production is being accelerated – and even the latest plan is predicated on the finalisation of an agreement for Bord na Mona to supply peat to two ESB power stations in Offaly and Longford. Yet negotiations on this have dragged on for two years and the ESB has not yet finalised planning permission for the stations. “Unite has been urging Minister Richard Bruton to intervene to progress agreement between Bord na Mona and the ESB, while also lobbying at European level to ensure that workers and their communities can access an EU-wide ‘Just Transition’ fund”. “We are determined to ensure that Bord na Mona, its workers and the communities they sustain are not forced to pay the price for the decarbonisation needed to secure all our futures”, Colm Quinlan stressed. The Group of Unions has reached agreement that any departure will be on a strictly voluntary basis and a Voluntary Redundancy package has been launched. We continue to engage intensively through the Group of Unions with management, to address the enormous challenges that will face the organisation and our members. It is clear that our engagement will have to extend further into the political arena with a view to generating value for the Midlands Community from the Just Transitions principles which everyone talks about but for which no meaningful budgets or plans appear to have been put in place”, Quinlan concluded. 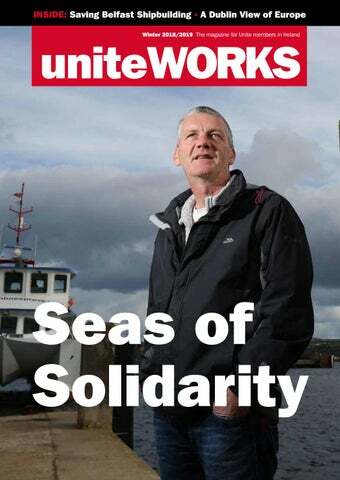 Seas of solidarity – from the Aegean to the Atlantic Solidarity is hardwired into both seafarers and trade unionists, so perhaps it’s not surprising that that Unite member and Rathlin Ferry skipper Michael Cecil has a habit of rescuing those in distress – whether in the Aegean or the Atlantic. In September 2015, the heartwrenching images of drowned three-year-old Aylan Kurdi washed up on a Turkish Michael Cecil beach provoked widespread small rigid inflatable boats (RIBs) horror, along with a feeling of boats with divers on board had run helplessness. But as a seasoned sailor, into difficulties, their exact location Michael Cecil knew he couldn’t stand unknown. Having spent much of his by: “I realised there was a major crisis life navigating the local waters, Michael going on, and I made up my mind that knew how treacherous they could be. I was going to do something to help.” After making enquiries, Michael travelled to the Greek island of Lesbos in January 2016 to join a group of activists who had been given a former RNLI boat to carry out rescues. Michael and two other volunteers spent three weeks learning Lesbos’ coastline, designing training programmes for future crew members and rescuing refugees from the Aegean waters. Although the September sun made the colours of the surrounding cliffs and hills sing, Michael knew the light bouncing off the choppy seas would it make that much harder to find the boats. He reckoned the boats would be drifting west with the tide and radioed the coastguard to let them know he and fellow crew and Unite member Connor McCurdy would keep a sharp lookout. “People were coming across in unseaworthy inflatable boats that were disintegrating by the time they’d made the four or so miles from Turkey – 60 or 70 people in nine metre boats. It was harrowing,” Michael recalls. Towards the western end of Rathlin Island – population 150 – two and a half metre swells were being whipped up by strong winds. Michael navigated around the choppier patches while Connor scanned the sea with binoculars, searching for the boats. As the ferry entered rougher waters in its search, the two men became increasingly concerned about the difficulties small RIBs would face in such conditions. Any Brexit deal must guarantee free access to goods and services across borders, north-south and east-west. Workers’ rights must also be protected – not just in the workplace, but in the community and in relation to cross-border working and mobility. shop steward Seamus Campbell, who pointed out that 65 per cent of the firm’s workforce come from the continent. A customs union deal would at a stroke protect trade and jobs. Unfortunately, Tory hardliners refuse any notion of a permanent customs union, risking stability in Northern Ireland and pushing negotiations ever closer to a no deal Brexit. The UK government’s red lines have helped ensure that the concerns of workers throughout these islands have not been addressed. complaints to the Department of Work and Pensions in London. After going through the initial, fourstage complaints procedure with the DWP, women are being encouraged to take the complaint to the Independent Case Examiner. The idea is generate so many complaints that the Government is forced to examine remedies for what campaigners term the “grotesque disadvantage” and financial loss suffered by the women. Unite’s Women’s Committee has endorsed their campaign and asks anyone born in the 1950s to step forward and help WASPI force the government to review its approach. can also find themselves exploited by rogue employers seeking cheap labour. The meeting heard of instances where apprentices have only been registered by their employer six months or a year after starting – meaning that they are effectively required to serve four-and-a-half or five years rather than the standard four years. The apprentice is delayed starting their career. And, during the additional period, the employer benefits from fully-trained, skilled but cut-price labour. Fitzgerald also told the meeting about the campaign waged by unions to improve terms and conditions in the mechanical sector, pointing out that unions have secured pay increases of over 30 per cent for apprentices since 2011, with current rates enshrined in the new Sectoral Employment Order. As Regional Officer for Construction Tom Fitzgerald explains, unions have a vital role to play in ensuring that the apprenticeship system benefits apprentices and the sector as a whole: “Our message to apprentices is a simple one: organise! Abuses of the system are far less likely to occur in unionised workplaces, and where they do the union can and does step in”. James McCabe is Secretary of the Construction Branch and a member of Unite’s Irish Executive Committee. He believes that young members are vital to the future of the sector: “Getting people to a meeting is one thing – but the really good news is that twelve lads came forward to be part of an organising committee. They now have a chance to help shape all our futures”. support – but then Belfast City Council complained to Unite saying we had cut across their plans for council signage. “I don’t understand their problem nothing is stopping them from putting up their own signs. The more the better as far as I’m concerned. If these signs help save just one person from taking their own life, that will make it all worthwhile”. workers, including those in Belfast, the work from multi-billion pound Royal Navy contracts are currently in procurement. The workers have their sights on two contracts: the supply of three Type 31e Frigates and three auxiliary fleet solid support vessels. However, in what seems to be a cost-cutting exercise, the Ministry of Defence has inexplicably categorised these vessels as non-military – which means have to be subject to global competition under EU law. The CSEU Charter demands that politicians vote to support recategorising these contracts. That would guarantee that the work goes to UK shipyards, securing jobs and skills for another generation. have resulted in Belfast being left to compete with shipyards internationally who receive the full backing of their respective governments. As a result, the industry has been allowed to contract to the point that it is today facing a battle to survive”, Mr Pollock said. Unite Regional Coordinating Officer Susan Fitzgerald is lead officer for the shipyard workers and said: “We face the very real prospect of the iconic Harland & Wolff cranes being left as little more than a tourist attraction – but we still have time to turn things around. The potential exists to create thousands of shipyard jobs right across the UK. Unite is not prepared to sit back and watch while this city’s shipbuilding legacy is frittered away. “These contracts will buy the shipyard the space to further diversify into the growing wind and tidal renewable energy sector, for which our skillset and deep harbour are perfect. This charter is ambitious for our shipbuilding industry. We need our politicians to demonstrate similar ambition for the sector. We need to see delivery before it is too late”, Ms Fitzgerald concluded. Unite’s ‘Period Dignity’ campaign is a multi-strand campaign demanding that women and girls have access to sanitary products in the workplace and places of education. Women and girls are entitled to have a positive period. As Unite Regional Equalities Officer Taryn Trainor points out, “Women and girls can find ‘that time of the month’ inconvenient and embarrassing – but having your period is a natural process, and we believe access to sanitary products should be as normal as access to toilet roll”. The campaign is being rolled out throughout the Ireland Region. TIME FOR ACTION on mothers’ mental health services Unite’s Community Practitioners and Health Visitors Association (CPHVA) is the professional membership body for those at the coalface of dealing with perinatal mental health issues. That is why the CPHVA initiated a partnership with the Royal College of Midwives and the National Society for the Prevention of Cruelty to Children (NSPCC) to conduct a major study into the issue in Northern Ireland. This pioneering research involved interviews with over three thousand healthcare professionals, and the results have been published under the title Time for Action. The study was launched at the NSPCC headquarters in Belfast and highlights the scale of the challenge facing the sector. The researchers estimate that, in 2016, between 3,611 and 7,223 women in Northern Ireland were affected by adjustment disorders and distress as a result of pregnancy, childbirth or becoming a parent. Although much lower at 48 each, the numbers suffering more severe postpartum psychosis or chronic serious mental illness were still unacceptably high. Mary Duggan liaised between the CPHVA and the research team. Welcoming publication of the results, she stressed the need for government action: “Maternal mental health is a major public health issue. While there have been many reports published, this is the first time in Northern Ireland that practitioners involved in providing care to women and their families have been surveyed. visits, screening tools, time during appointments and communication with other health professionals. These are all being undermined by austerity cuts – the ultimate false economy. “At each stage of their journey, women deserve to have access and intervention from practitioners with the appropriate specialist knowledge and skills. The cutbacks mean this is being denied to them”, Duggan pointed out. Caroline Cunningham NSPCC Senior Policy Researcher, Ethel Rodrigues, National Officer CPHVA; Mary Duggan, Perinatal Mental Health lead, CPHVA; Janet Taylor, National Chair, CPHVA; Susan Gault, Head of Public Health Nursing Northern Health and Social Care Trust. “Health visitors work with families and know that this illness can impact negatively on partners and children if appropriate support is not available in a timely manner. “This is an invaluable piece of research, but it should not have been left to Unite and our partners in the NSPCC and RCM to quantify the scale of the challenge we face in an effort to secure the needed investment. It’s Time for Action and the government must step up now to invest in perinatal mental health”, Ms Duggan said. Remembering John Ryder The church of St Nicholas of Myra in Dublin’s Liberties was full to capacity for the funeral of local man and full-time ESB Branch official John Ryder, who died suddenly on 27 December 2018. In a fitting tribute, John’s casket was covered by the flags of both Unite and the ATGWU, one of Unite’s legacy unions. The cortege was also adorned by a traditional Dublin Council of Trade Unions banner – itself designed by actor and union activist Jer O’Leary, who had passed away the day before John. As well as a wide circle of family, friends and union comrades, mourners included Unite Regional Secretary Jackie Pollock, former Regional Secretary Jimmy Kelly, ICTU General Secretary Patricia King and Mandate General Secretary John Douglas. They joined John’s widow Lynda and children Katie and Paul to hear tributes to a loving son, father, husband and comrade whom Unite ROI Senior Officer Brendan Ogle recalled as both passionate and astute in defence of workers. Politicsmatters! Have you checked out our political blog in the Republic yet? In the neoliberal era, Unite believe it is critical that modern trade unionism fights for members and their communities both inside and outside the workplace. The factors that impact on our members’ lives do not stop when they leave work, or end at what used to be referred to as ‘the factory gate’. We need to ‘unite for a real alternative’ to the failed politics and policies which have left ordinary working people unable to make ends meet in the face of a low pay crisis combined with spiralling housing and childcare costs, while 10,000 people are homeless and many more in housing need. Unite’s political approach is based on the Right2Change policy principles. Go to www.right2change.ie to find out more about the policy principles, and check out Unite’s political blog at www.uniteforarealalternative.blog. Most posts are written by Unite ROI Senior Officer Brendan Ogle, and the blog is regularly updated. Please contact noelle.whelan@unitetheunion.org if you would like to receive new posts via email. future of the plant, which supplies around 30 per cent of Europe’s alumina”. While getting US sanctions lifted was a priority, Thompson points out that there is more work to be done: “Now that sanctions and the associated uncertainty have been averted, local management and unions must focus on securing investment in the facility to ensure the future of Aughinish going forward”. emergency are ostracised and even ridiculed. This lack of democratic debate creates the perfect climate for far-right populism to grow. Where our institutions act as agents of privilege, that growth is not only inevitable but our ability to maintain and build tolerance and openness at community level is undermined. Our duty as trade unionists is to resist racism, xenophobia and hate speech. The EU’s duty is to embrace democracy, not only for its own sake but as a bulwark against extremism. AES a one-year System Support Services Agreement contract for Kilroot power station. Unite Regional Officer Joanne McWilliams welcomed the aboutturn: “Unite has been campaigning since January to avert this jobs threat. Now, we must ensure that this contract rolls over for another year as widely expected. “But the news is not all good: Up to eighty AES positions will be lost with the closure of Ballylumford B power station. While we hope that most job losses will be achieved through voluntary redundancies across both sites, this still means eighty fewer jobs.” Outlining the union’s alternative approach to the market model dominating the all-island electricity sector, McWilliams pointed out that the concept of an energy market is not working and will not work: “It is designed to benefit shareholders rather than the public or workers. It is driven by right-wing ideology as opposed to common sense economics. “Electricity workers are footing the bill for the failure to invest in a managed transition to renewables which would involve upskilling to fill new jobs. Meanwhile our economy has been left reliant on last generation’s technology to ensure security of supply. We need a state-led approach predicated on nationalisation of this vital industry, north, south, east and west, opening the door to the large-scale public investment needed to create the energy jobs of the future”. (IAC), which still refuses to negotiate collectively with workers. Unite Regional Coordinating Officer Richie Browne is in no doubt regarding the significance of the deal: “The agreement negotiated with Rubicon not only provides workers with a significant pay increase but also offers Rubicon certainty over the next two years. Other companies now need to follow Rubicon’s example by recognizing their employees’ right to representation, attending the WRC and negotiating collectively with their workers”. Jean O’Dowd is chair of Unite’s Archaeology Branch and believes the agreement points the way forward for the sector as a whole: “The success of archaeological consultancies is due to the skill and commitment of their workers. Rubicon has now recognised this by signing up to a deal which sets the standard for the entire commercial archaeology sector. Now we need to continue pressing for a Sectoral Employment Order which will not only ensure decent terms and conditions, but will provide both workers and employers with certainty going forward. This can only be good for our sector as a whole”. Jim Downey of Hyster Yale which voluntarily signed up to the Equality Charter, with Una Wilson (Equality Commission NI). Jeff Robinson (Irish Executive chair) and Regional Secretary Jackie Pollock care provided to new mothers. “The NSPCC and the two unions representing healthcare workers at the forefront of dealing with this issue came together to produce this invaluable research, and we now need to see government action”. workplace to create an environment that promotes wellbeing, including reasonable adjustments for mental illness. The Mental Health Charter being promoted by Unite in our workplaces is designed to facilitate a partnership approach to the issue”.